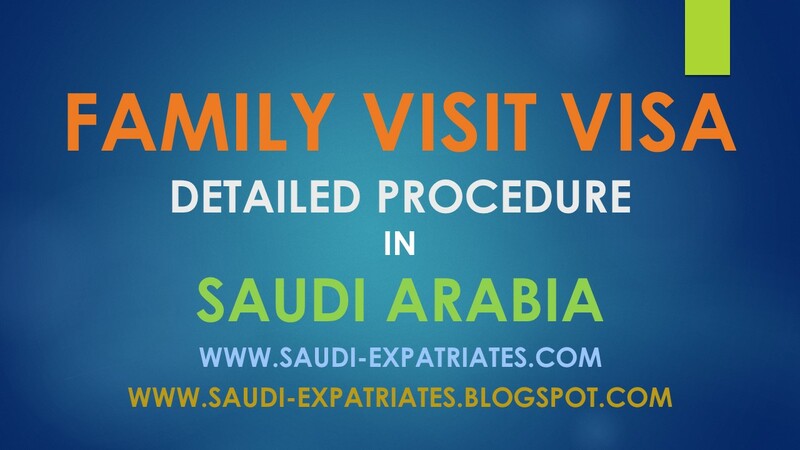 We can only invite the following persons in Saudi Arabia family visa either it is visit or permanent. Mother, Father, Wife, Children, Sisters, Mother in Law, Father in Law. Saudi Arabia may not be a place of fun or entertainment to the expatriates who are staying alone far from their country. They have an option of feeling home by bringing their family either in visit or permanent visa depending on their Iqama/Muqeem professions. permanent visa has more benefits than visit visa, as it does not have tensions of renewing. If visit visa has a validity of 3 months (90 days), It is possible to renew it 1 more time, that is up to 6 months. Renewal may be unsuccessful in the months of Ramadan and hajj. Only benefited professions are applicable for applying family visa. If your iqama or muqeem profession is not benefited one, request your sponsor to change your profession to benefited one. 3. Passport copies of family members to whom you are inviting. You are the kafeel of the family members you are inviting on family visa, So put your name in place of kafeel while filling the online form. 1. Visit Ministry Of Foreign Affairs, Choose English as language at top right. 2. Click on Individuals, Choose Resident. 3. Select the one you are looking for, Choose 90 days for visit visa. 4. Fill the form and submit. 5. Take a print out of it .
" APPLY FOR ONLINE FAMILY VISIT VISA APPLICATION"
1. Sign and put the date on the printed application. 2. Take sign and stamp of your sponsor on the printed application. 3. Visit to chamber of commerce of your city where your employer is registered. 4. Pay fee of visa application approximately 30 SR to chamber of commerce. 5. After submitting, You will receive a print out from chamber of commerce. It may take a week or more to process your applied family visa. Keep patience and check your status everyday. 3. Enter your application number, Iqama number and image code. Once your family visa got approval, Send copy of your application or the number of your application to your family member and let them contact nearest agent (will charge) for further process in Saudi embassy of your home country. Documents required for this process are Original passport of visa applicant, Your Iqama copy, Your Passport copy, 4 passport size photographs. Marriage certificate and copy of the passport and iqama of your wife. It is common sometimes your visa application may reject, Do not bother, Apply again and again till you succeed. Sometimes it may accept 4th time, sometimes it may accept first time only. So do not loose hope. Once visa is approved Saudi embassy have 3 months of time for stamping, Once visa is stamped, Applicant should travel within 3 months else your visa will expire. 1. If your visa is issued for 90 days you can extend it for 1 more time. 2. If your visa is issued for 30 days you can extend it for 5 more times. For detailed process of renewal follow this article "Family Visit Visa Extension". Do not think of overstay, It is illegal, As you are the sponsor of your family you only responsible for it. A fine of SR 25,000/- is imposed on iqama even you stay for single extra day. Sometimes it will accept first time, Sometime you need to try twice or thrice. Can I bring my stepmother in visit visa as my biological mother is no more alive. Yes, If she has your father name and same address in her passport. My mother visa has stamped on 20th of January 2015, but on passport visa the validity is one month to move to KSA.My problem is i want to bring my mother in march.So what should i do now? ?Please answer me as soon as possible. It seems, you got 1 month (30 Days) visit visa? If i am not wrong ... If it is stamped for 1 month you can extend it for 5 more months. As above mentioned, Once visit visa stamped, You should travel within 3 months starting from stamping date. If you still unclear, You can login to your MOI Abshir account and check your dependent details. Once stamped, Within 3 months applicant should travel. i applied for my visa on the 24/01/2015...on 26/01/2015 request was ratified from the east room..after that no status change..i am in dilemma wether i will get the visa or not pls tell me how long does this whole process take approximately..
You should wait for some more time, As they get lot of applications it may take some more time. Hope for good... No need to be in dilemma, You can get clear status soon whether its accepted or refused. Even if it is refused you can apply again after few days. Mr. Kashif, You can re-apply again if it is refused, May be people are true, I am not sure about that, If this is the problem, You can try again. Now a days iqama is renewing 3 months before its expire. So wait for your iqama to be renewed and then re apply again. my iqama profession is starter data entry,can i aaply visiting visa for my family..
Mr. Shafeeq, Yes you can, Make sure you get sign and stamp of your sponsor on it, while submitting to Chamber of Commerce. Sometimes sponsors may not permit new employee but you can try. My wife is in ksa on visit visa came through the Riyadh airport and now she want to go via bahrain casueway by visiting Bahrain and then to India from Bahrain airport. Is is possible for her to get an exit at the King Fahad Causeway Dammam instead of Riyadh Airport. I do not know exactly about it, For iqama holders it is possible, But for visitors i do not have an idea. my iqama profession is Computer Operator مشغل الحاسب الآلي can i apply for visit visa and how many days it takes? You can request your employer, That you want to bring your family on visit visa. As long as i know operator is not eligible. However if you have degree you can change your profession to the benefited one. Time I cannot say exactly, It is depending on the range of visa applications. My Friend who is from India last week applied for a Family visa (Wife, Mother & Unmarried sister) who was under one visa application. Therefore, within 1 week the visa for wife (90 days) and mother (30 days) is approved, however, therefore is no status showing on sister's visa which was under the same visa application. We shall be grateful for your kind advise and recommendation on this. Also, the visa for wife and sister should be stamped in how many days from the date of issue. Askm. My husband and I are both employed with MOH. We have our respective iqamas. As I cannot travel to Jeddah presently to apply, is it possible for my husband to invite my parents on his iqama although I am not a dependent and I have my own iqama? Will they accept this application at the Ministry or insist that I apply on my own iqama and come personally as I am also a government employee? Its not approved yet, It will be a mandatory rule in upcoming days. I would like to bring my parents on visit visa. Can you please tell me that I can bring my parents on visit visa as I am unmarried. Yes you can bring your parents on visit visa even if you are Unmarried, But if you are married you will get easy approval for your wife and parents too. As Unmarried you may need to try twice to thrice for approval. Best of luck. What documents I need, only mentioned or kile before documents as attested certificates etc. One of My friends told me that now we need to deposit only 1000SAR and no need of any attested documents, only the thing is that Profession must be good. Dear Masroof, I did not heard anything like this. what about new rule of family visit visa regarding online appointment?? it's available now...an online appointment...you must have first an Abshir Acct.. I have access to abshir, please tell me the procedure of applying visit visa for family. I have two pending visit visa application for my wife. 1st: 09 Sept 2014 (status: ratification of the east room). Until my Iqama had expired last 11 Nov 2014, I re-applied. 2nd: 27 Nov 2014 using the renewed Iqama (status: ratification of the east room). Until this date, both applications had same status and it's not even rejected in MOFA system. By the way, I am a project engineer visa based on my Iqama. I don't really know what's the problem why until now there's no movement on my applications (I think this is not normal based on the length of time since I applied). Can I have your opinion on how to have a visit visa based on this case? I do not have clear idea about that, But i request you to re apply again, Make sure your passport have a minimum validity of 6 months. Why the passport validity is important to them? Passport is your national identity, Its shows your citizenship, Without valid passport you cannot fly anywhere. But, it's understandable in case for the visitors coming to KSA on visit visa. But why it's important for the sponsor (like us) applying for family visit visa? Do we also need to fulfill this condition? If your Passport expired, You do not have valid identity, If you itself invalid, how can you sponsor some one. Dear Sir, My profession on Iqama is 'AAMIL NAZAFA'. I am trying to bring my wife and daughter since long time but no luck as of rules my actual position is Database Administrator in military hospital please any help. Mr. Ateeq, As you said your profession is "Aamil Nafaza" it means "Dustman" as i translated. This profession is not eligible. I request you to go to your HR Officer and request them for change of your profession and mention you want to bring your family in visit visa, If you have attested degree certificate submit it to them so that they can change your profession. He may tell you to come later, You should request him again and again by giving few days gap, so that he can process it. Translation: "Apology hope to mobilize a new request certified according to the new update to the application form"
I have got the above message after 1 month of application for family visit visa, please guide me about the reason for this rejection. I have an Engineer iqama and applied for three family members in a single application, my mother, wife and daughter. Mr. Fahad, Rejection is common you should try one more time. Yes Mr. Sheriff, Your profession is eligible for visit and permanent visa. Family visit visa is not available for low profession categories. As mentioned first preference is wife and children, lets wait and see whether parents are included in first preference or not. I am planning to call my in laws in the month of July 2015 ( Ramadan ) for three months. 3- After stamped VISA within how many months they have to travel. 4- To call them in Ramadan when is better to apply VISA so that it will not rejected. 5- What are the moths when VISIT VISA close. Dear Sarfaraz, If you did not read the above article, I request you to read it. As it contains all the answers of your queries. While applying you have an option to choose whether for 30 days or 90 days. During Ramadan and Hajj it will be close, Remaining all queries are answered in the above article. Keep patience till your status change, Once change you can copy the arabic text and translate in google using "translate.google.com"
or you can ask any arabic person to translate it for you. Copy Arabic text and use " translate.google.com " or paste arabic text of your profession in comment. Alhamdulillah I got visit visa for my father and mother today, but there was no information about my brother who was also included in the application please update your suggestion. Also regarding to validity many agents in India say 3 months before and 1 month after stamping of visa but in your above comments it was different please re confirm the actual validity as I want my parents to come in ramzan. Thanks and awaiting your favourable reply. Alhamdulilla, Good to hear from you, As mentioned above, Wife, Children and parents are the first preference, then Sisters and Parents in Law. Brothers are not eligible for visit visa unless you have special reasons. I think you can see the validity of travel in stamped passport. Dear Respected Farhan bhai, thank you for help everyone, my online application was chambered on 21st January-15. and today date is 20-Feb-15. One month passed, still showing green color status not yet change anything. nor reject, can you plz. confirm as per new system, for family visit visa, do i need to go to Istekdam to submit my all documents before it approve in mofa site? . or i will have to wait.. till online application is change either reject or accepted ? plz suggest me what i should do.. as i heard as per new system from January, there is appointment system for istekdam.. that applicant should visit to the istekdam and submit all documents even for visit visa. same procedure apply for visit visa as for the permanent visa.for visit visa also need to submit Education Certificate attest by country ksa embessy ? plz help me with this informaition. Dear Saif, Please wait for the status to change as approved or rejected, One month is really long time, But in some cases it happens, So, Wait for few more days.For visit visa no need of attestation of certificates from embassy. I am worried about the validity before stamping whether it is 30 or 90 days. If it is 90 then I will submit later else have to submit it and see for the validity after stamping of visa. 3 months for stamping after issuing visa , Should travel within 3 months once visa is stamped. Dear Osman, Please wait for your status to change. I had the same case, i applied on 4-jan-15. My status was updated after 43 days, and the message was "Mobilize a new request certified, as per the updated system. Read the reply of Mohsin Ali Khan. I have applied for my family visit visa when i filled the form there was an option for age. Now when i see at MOFA website its date of birth and where i entered age its showing 1/11/1111. what should i do. Last time i just got the visa in a day but now its 1 month no reply from them. does it make any problem if my wife is here and i apply for a visit visa. She left KSA on 18th Jan 2015 and i filled the form on 17th Jan 2015 got it cambered on 18th Jan 2015. Tell your company HR Officer, He may guide you. No problem, Even you have two, They will accept valid one. Dear Mr. Naseem, Data Entry Operator profession is not eligible, You can request your sponsor that you want to bring your family in visit and request him to change your profession, He will change your profession with suitable one related to your job without certificates. I have heard that there are some new rules in applying for family visit visa, now we dont want to go mofa and need to take appointment from isteqdam. Can you please guide me or share the link so that I can get the clear picture how to apply for visit visa so that no rejection may occur. Even i heard about that rule in news, But till now its not applicable, as far as i seen. May be we need to wait for some time for it to applicable. Yes for now you need to go to MOFA office, This new rule is not yet applicable. Please guide us on applying visit visa through MOI or isteqdam, it would be really a great effort from your side. Thankful to you. I will surely post one article soon on it. I've applied for a visit visa for my mother, wife and daughter on 4th of january 2015 and until now the status has not changed online its showing the same. Generally how many days will it take for the status to change or how would I come to know if my application got rejected. and when can I reapply for the 2nd time after the 1st application getting rejected. Dear Rizwan, Normally it should take one week to one month. I request you to check the status, Copy arabic text and find it in the below mentioned page. Most of your information is wrong. Now new visit visas only extend upto 6 months.if its issued for 3 months then only it can be extended 1 more time. so total duration for visit visa is just 6 months. not 9 months. and if its issued for 1 month then u can extend it 2 times more not 5 times. so it becom just 3 months. Your status is Authenticated at Chamber Of Commerce Jeddah. Wait for it to change or visit MOFA. Dear Sarah who gave you that information that it got deleted did you got this answer from MOFA. If yes can we give them our application chambered and check. I can apply for visit visa for my parents? Dear Ansif, You can request your sponsor that you want to bring your parents in visit, I think your profession is not eligible. You can change your profession related to your job, if you have attested degree. How i can apply visa for my mother in law because my wife also in india i want to apply visit visa for my wife and my mother in law.And second thing on my iqama my profession is Labour so is it possible to apply visit visa for family pls reply me as soon as. I think labor profession is not eligible, However you can try online and see whether application permits you to apply or not. Recently i posted article on "how to apply for onine visit visa application" check that. I am a 2 Year Diploma Holder in Surveyor, I am currently working as Quantity Surveyor. Mr. Ahamed, There is an article for "ELIGIBLE PROFESSIONS LIST" check that if you do not find their, Try to apply online "ONLINE FAMILY VISIT VISA APPLICATION"Check whether it permits you or not, If not change your profession on iqama. My Wife is in ksa on visit visa on my iqama..
is it posible for me to apply visit visa for my father and mother in law?? My wife is on visit visa in ksa..
is it possible for me to apply for the visit visa of my father and mother in law?? My family in ksa on visit visa.and they have got visa extended till May. I would like to know whether I can apply for new visit visa while their stay in ksa. Or is it possible to get a visit visa during ramadan time June 2015. Please let me know what to do. . Yes you can apply for your parents even your wife in already in KSA. Thank you Farhan. I would like to know one more thing, when should I apply for visit visa as on june ramadan starts and their visa expires on may30. Visit visa is only for 6 months, no renewal or extension after six months. Visit visa should renew before one week of its expiry date, if visitor did not complete 6 month. You can apply for New visit visa once your family is out of kingdom. I dont know exactly, May be you need to wait for one week. Ask agent what is the solution for it, He only know what the exact problem is. I am going to marry a girl who is with her parents under 'bint' (daughter) visa. I am planning to marry in native. But how can I change her to under wife visa? It is possible? Please let me know the procedures for this. Yes you can bring her as your wife, By providing Marriage certificate. As you told me that passport validity of 6 months is also required for me as I am the sponsor of my family. But, after renewal of my passport how would I update this information in MOFA system? Or how will they check my renewed passport validity? Dear, Is it possible to bring a divorced sister along with her child ( 2 years old boy) under visiting VISA to Saudi Arabia. pls let me know what are the procedure & documents required to be done. Family vist visa first preference is Wife and children, Second preference is parents and parents in law, Brothers and sisters are rarely possible. you can try. Thanks for reply, what about ringing her child? Does this mean that MOFA has received my application? or does it just mean that it has been stamped at the Chamber of Commerce only? Once activated at the MOFA Counter, does the msg show something else? You can try.. May be yes..
My passport will be expired in Apr.2015. My wife visit visa has been approved by MOFA. So my question is that can I submit my this passport copy to Etimad center for Visa Stamping? Its better if you submit after renewing your passport. What is leatest rules for Permananent family visa. I heard that TV Chanel news on 17/02/2015 Degree certificate attaestation not required for Permananent family visa.only requied Eligible proffesion in there sysytem. What is leatest rules for Permananent family visa. I heard that TV Chanel Degtee certificate attestation nor required for Permananent family visa and only needed Eligible proffesion in there sysytem. Sometimes that may be possible, But not all the time. Actually i applied 3 times visit visa for my parents but they rejected i don`t why they are rejected. please tell me why they are rejected because i have 3 persons my parents & 1 brother..please tell me why they are rejected..
May be your profession is not eligible, Or possible because of brother in list,Sometimes they will accept if your brother is below 18, for above 18 they will not accept. Family visit visa is only for Wife, Children, Parents, Parents in Law. Very rarely they will accept brothers and sisters. Name should be in English only as in passport, No problem whether it is small letters or capital letters. Hai Farhan, i am a staff nurse.i have valid iqama and the profession is staff nurse.is it possible for me to get family visa for my husband. can i call my wife aunty or my aunty on visit visa. since my wife mother and my mother are too old to be called here. my wife is pregnant and she want any one to help her during delivery. Visit visa is only for first degree relatives, It means for Wife, Children, Parents and Parents in Law. As you have valid reason, Sometimes it may accept, But i worry how you provide document proof for aunt. i apply family visit visa feb 23,2015 ratified feb 24, 2015 but still no status change...i have heard that family visit visa application january and february was deleted due to system upgrading is it true? i applied family visit visa feb 23, 2015 coc done feb 24, 2015 but still no status changed it was already 1 week till now..is it true that family visit visa january and february application was deleted due to system upgrading at mofa.? I am not sure on that, visit mofa and confirm about it. I am working with Almarai Co,as a stock controller, as per IQAMA my profession is خازن can I apply for the family visit visa? Try to submit online application, and see whether it permits you or not. My iqama profession electrical and i applied visit visa for my wife on 18-feb-2015. still it green color.. some of my friends said you should submit your chamber paper to mofa. some friends said no need it automatically link with mofa once you get chamber..
what can i do? and my paper chamber in damman. right am in jeddha..
you need to submit application to chamber of commerce where your employer is registered, Read the above article. Yes Technicians can bring family on visit visa. sorry I am asking the repeated question but I am afraid I one of my friend suggested me to stamp visit visa within 1 month after issue ( not 3 month ) and also travel with in 1 month ( not 3 month) after stamp or else it will expire. due to some reason my wife and son can only come in june . what should i do.. Yes most of the people are saying one month only. It seems to be true. I applied visting visa on 16/02/2015 now status is going "Demand under the measure". so please help me sir what is next proccess. I feel one letter is not a problem.